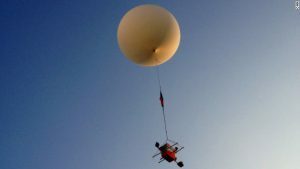 A convenient way to gather atmospheric data at high altitudes is to use weather balloons (current record altitude for unmanned gas filled balloon seems to be 53 km of BU60-1 Japanese balloon). As this kind of devices is used for weather forecast and research the specific literature on the topic is widely available  and consolidated. Air data systems are a common payload across that kind of probe, from here our interest on the topic. Here we introduce the basic hardware, provide a basic calculation script for balloon sizing and describe the ground filling operations. The topics involved are different and heterogeneous so we will split topics along a mini-series of articles on balloons. We will focus on the most common DIY setup, a sealed balloon filled with helium and with a rope suspended payload. Helium is lighter than air so it makes the balloon float. Any component you chose to use should be reliable, safe and disposable. Redundancy can be the winning choice. The payload can be put within a box or exposed to the atmosphere, in both cases consider the low ambient temperatures; temperatures can affect electronics, and batteries, nominal operation. In the tropopause the temperature can fall below -50°C. Refer to Figure 2, the probe is composed of five main parts. 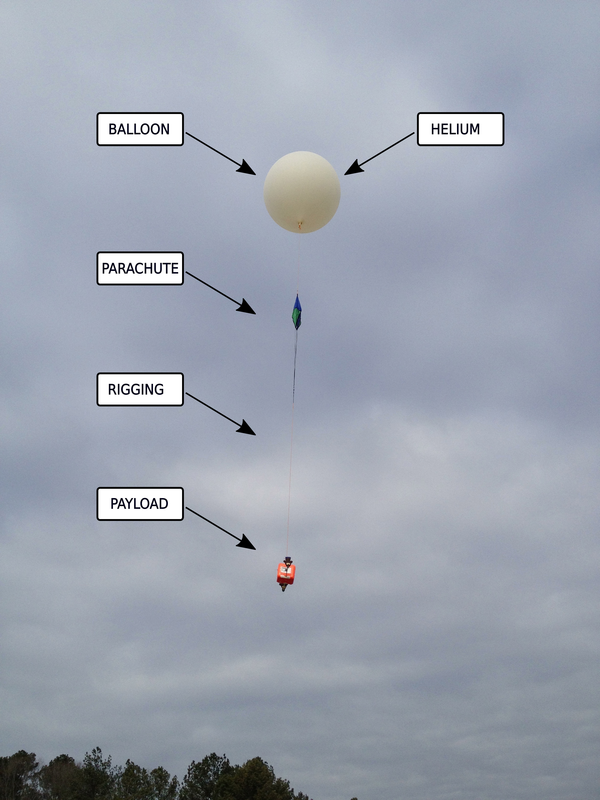 The balloon, the rigging, the recovery parachute, the payload and the balloon filling gas. The typical setup is shown in Figure 3. We will focus on latex sealed balloons, this kind of balloons will expand as the probe ascends and will burst when their maximum diameter is reached. Availability is good and they are affordable. Medium high altitudes, let’s say around 30 Km, can be reached without too much hassle. The balloon is secured to the hanging payload by means of strings, any string or accessory used for this purpose is part of the rigging. That is not an issue for small payloads but it is of relevance with heavy payloads; balloon wall is thin, it’s not able to support heavy loads, a concentrated load will pierce the envelope. 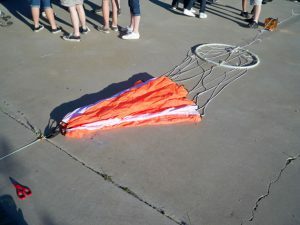 The parachute will slow down the payload descent when the balloon explodes, during the ascent, the parachute is already exposed and hangs from the rigging. The payload is composed of all the hardware that should fly with the probe, we can divide the equipment into two big families. Common equipment and mission specific hardware. The first family includes all the hardware that is absolutely necessary to fly, typical hardware listed in Table 1. Power source, battery pack. Can be one single power source for every component of the probe or the power can be distributed among different devices. It is to be considered that power source is mission critical. For most important probes it’s possible to use dual failsafe power sources. Position tracker. Any device needed to locate the payload after touchdown. With low weight probes, a GPS-based locator can be used. See for example. The probe will be located after the touchdown with a cell phone. Most complex probes can have a full duplex telemetry radio link active during the flight. Besides that, you need mission specific hardware. 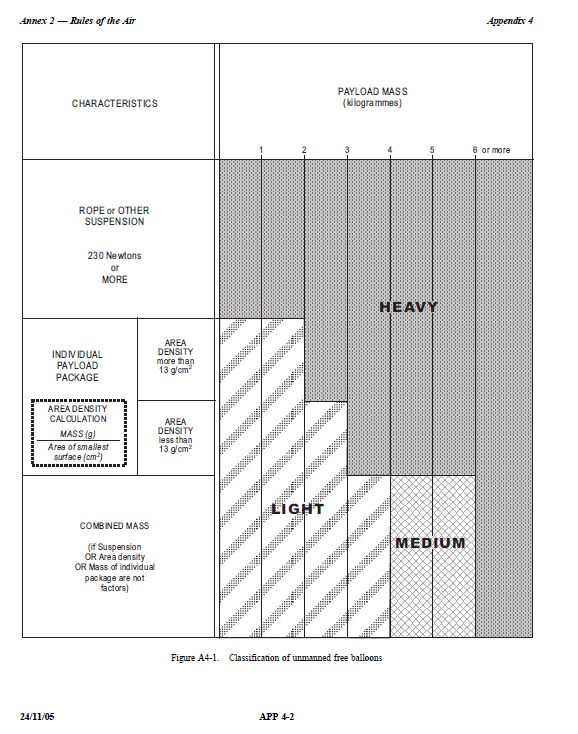 You find a typical list of components in Table 2. Camera. You can have also multiple cameras. For example, one looking downwards and another looking to the horizon. A useful feature is to have the possibility to shoot pictures at determined times. Pictures are usually stored on a memory card or solid state device, the storage limit has an impact on the possibility to have a full photo coverage of the flight. Air Data Computer. Equipped with sensors for external temperature, pressure, and humidity. Vertical speed probe. Apart inertial data it is possible to have a dedicated probe to measure vertical airspeed. To produce a really simple, and conservative, model we will work under strong simplifications; generated model can be used during the hardware selection phase but it is not suitable for accurate performance prediction nor for flight simulation. Refer to figure 5, let’s model the whole probe as a mass point. Our probe floats thanks to the buoyancy. 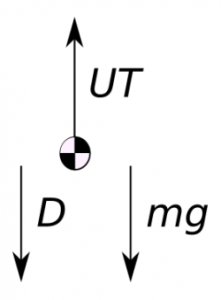 The upthrust available using a sealed balloon is proportional to the weight of displaced air where is the balloon volume and g is the gravitational acceleration. The balloon, of diameter will expand as the air density decreases, as a direct consequence the forces exerted on the balloon material will increase. In the specific case  the stress on the material section will be equal to . Apart the punctual value the stress is to be noted that if the stress is greater than zero then we have that internal pressure is greater than air pressure . The pressure inside the balloon is not equal to the external pressure. To avoid the mechanical treatment of the mechanical expansion we will work under the hypothesis of “rigid balloon” or the so called not stressed balloon, the internal pressure is exactly the air pressure. 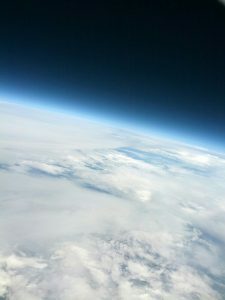 During the ascension, the balloon will expand because of the temperature change to the air and to the helium. During the ascent the air temperature will change, the helium temperature will change too. The temperature distribution across the balloon volume will not be uniform, as a simplification in our model the temperature will be a determined parameter. The temperature across the atmosphere will be assumed to be distributed as per the U.S. 1976 Standard Atmosphere . Solar radiation contributes to balloon energy balance  so will have an impact on expansion, we will neglect also that contribution, for the peace of the mind think that you are estimating the performance of a night launched balloon; bibliography reports  lower ascent ratios during the night. Where is the still air rise rate in m/s, is the cross area of the balloon and is the coefficient of drag for the balloon. The coefficient of drag is dependent on and Re. This drag coefficient should consider the contribute of the payload and rigging, but this former contributes are often neglected, most accurate way to determine coefficient value is by flight test  or wind tunnel testing. A less accurate approximation is to consider the balloon as a perfect sphere, in such a way we can use the coefficient of drag for a sphere. We will operate with that assumption. The coefficient of drag of a sphere depends on the Reynolds number , so on the density; for this reason, the should be considered a function of Re and practically of altitude. In our model we will set the drag coefficient at 0.47; that will be a value too high for ground conditions and far more appropriate for low Re high altitude conditions. Setting a high will overestimate the drag force near the ground, that will give to us an optimistic or conservative estimation of balloon performances as the ascent rate. At the balloon bursts, the probe will initiate to fall back to Earth. To avoid mushing of the payload the recovery parachute should be correctly sized. Reusing ascending equations and replacing the parachute coefficient of drag instead of the balloon we get the expression of vertical descending speed. Where is the area of the parachute. Equation 4 neglects the contribute of the payload drag, likely we will overestimate the descending speed. Prior to any launch please check your local regulations about unmanned gas balloons launch. To date (15/04/2016) in Italy in necessary to notify the launch to ENAC, with this modules. The Italian Civil Aviation Authority names the ICAO  Annex 2 Appendix 4 as the source for determining what data should be communicated prior to launch to ENAC. ICAO define different classes of unmanned balloons, classification is based on payload weight. For example, a balloon with a single package payload(anything different from the balloon) that weights less than 3kg is considered as a light balloon. To be considered light the payload should be suspended with a rope that requires an impact force less than 230N to be separated from the balloon. 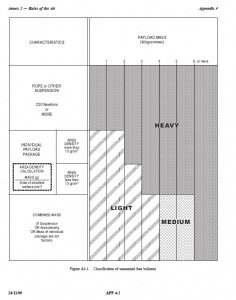 Another requirement is to have an area density of less than 13g per square centimeter. To calculate the area density you should divide the mass in grams of the payload package by the area if square centimeters of the package smallest surface. A light balloon has less operating limitations respect to heavy balloons. The design is an iterative process, sometimes you should redo the same procedure over and over up to the solution convergence. At first, you need to decide you mission objective, the more constraints you have the faster you will found a solution. For example purposes I selected the following requirements. Note that in the list it is included the burst diameter, that data should be supplied by the balloon producer. 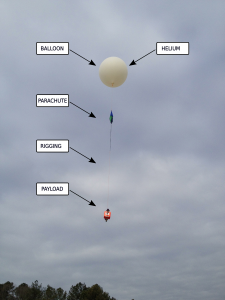 As a result of the preliminary design, we will determine the required balloon size, the mass of helium to load into the balloon at ground and the buoyancy at ground. You can see the desired design output parameters in Table 3. We have a model of our balloon and we have defined design output parameters, within the next post we will use a Scilab/Matlab script for sizing. Burst diameter should be read from producer data or found by experience, for example, see this table. You see that our preliminary design gives to us an indication that our balloon sizing can provide the required performances. Another alternative and quick way to proceed is to use online design tools that are prepared by the balloon producers, for example. Typically those tools are designed to be on the safer side, they will be pessimistic about performances; results are good for design but do not provide an accurate balloon behavior description. We have other aspects to consider before the launch, as the trajectory prediction. Balloon trajectory is highly dependent on the wind. Once again we’ve to consider that the available data on wind is far from to be complete or exact; often we desire to know a trajectory in the next future and so the simulations will be based on a wind forecast. Beside that we can find some trajectory predictor, for example, this in this link from CUSF. From the predictions, you will notice that balloons will cover wide distances, it is necessary to have one or more well-prepared recovery teams that can easily travel across the country. We’ve exposed some aspects of balloon operation. Key factors are preparation, training, and performance estimation.